Thank you Barb, from Second Chance to Dream, for bringing some colorful springtime creativity to the Be Extraordinary! blog. Barb is an incredible teacher and life-coach who also has a wonderfully creative side that she is sharing with us today. Enjoy connecting with Barb today! Hi "Be Extraordinary" fans!! 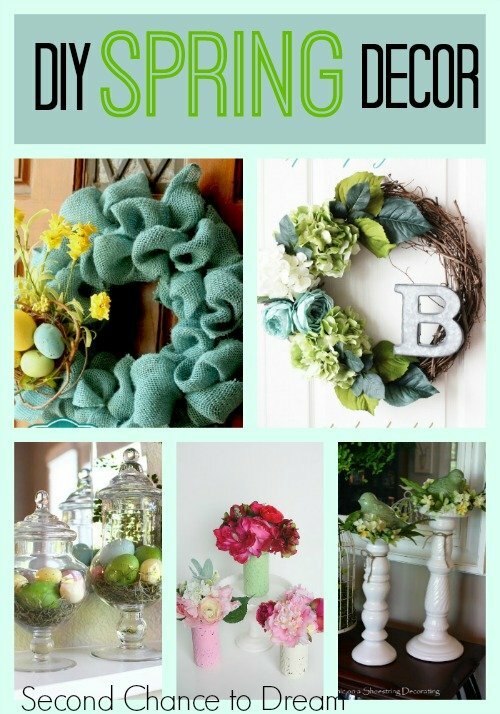 I'm so excited to be sharing with you some DIY Spring Decor projects with you. It has been one long winter and sometimes our creativity gets frozen with each passing cold day. 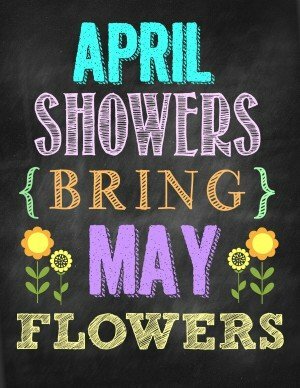 I LOVE Spring! It means new life! It's so exciting to see the grass green up and the bulbs pop up. So while I wait for that great thaw I will dream and find a spring project or two to work on. Here are some ideas I gathered. 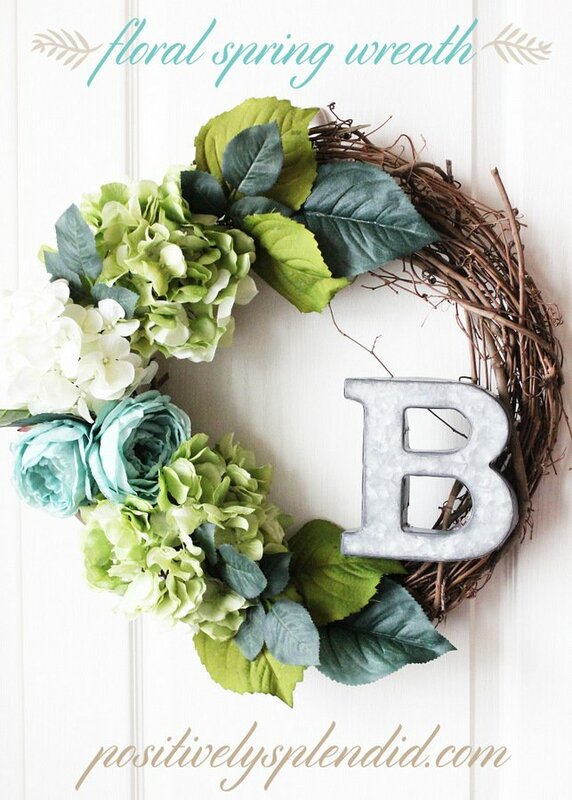 Wreaths are a great way to welcome someone to you home. I usually have a wreath hanging on my door and change it every season. I like to do things frugally so I can change things up. Here are a few wreath ideas. 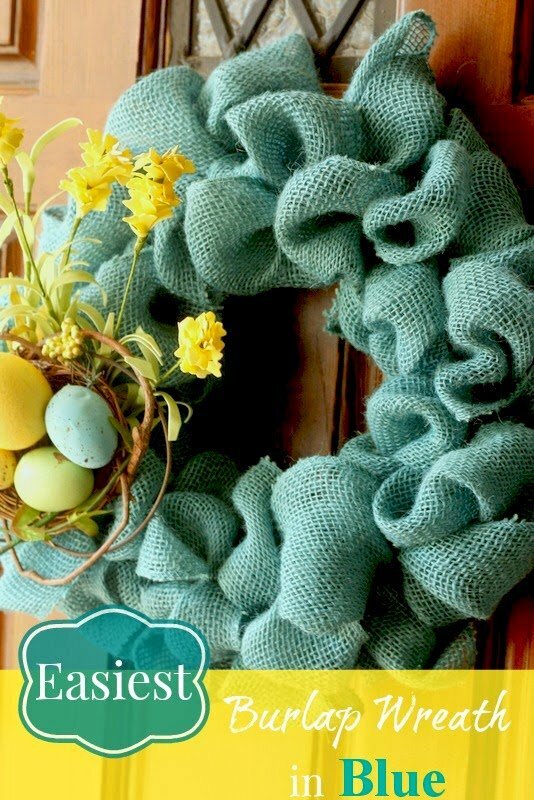 This beautiful blue burlap spring wreath by Top This Top That is so inviting. I think this would look fabulous on my front door! Or if you're looking for a little more natural look this Paris inspired grapevine wreath by Positively Splendid is so pretty. Wreaths don't need to be just round or made out of traditional materials. 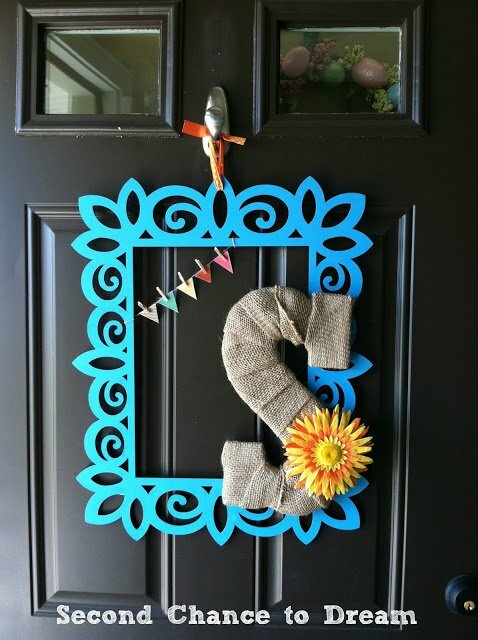 Check out this Spring Monogrammed Door Hanging. 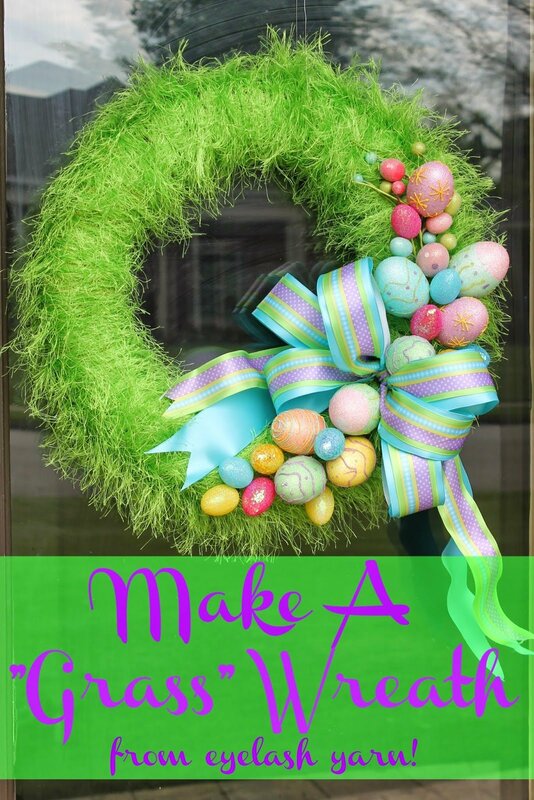 Here is a fun Grass Easter wreath by Miss Kopy Kat if you want to focus more on Easter than spring. 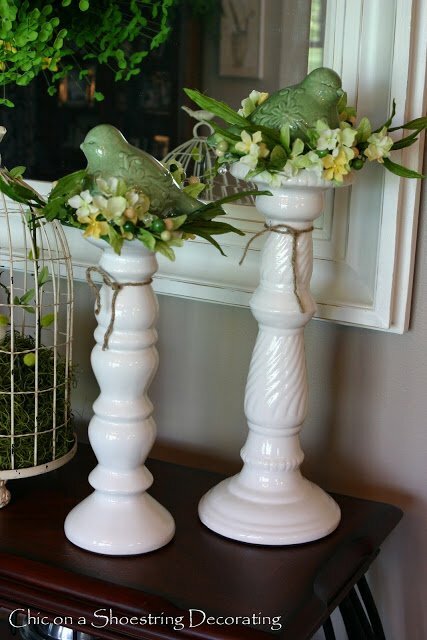 These super easy DIY Candlesticks by Chic on a Shoestring would be perfect on my mantel. The candlesticks don't have to be glass. If you have some old brass or wooden ones give them a coat of paint. You will change the whole look with a coat of paint. 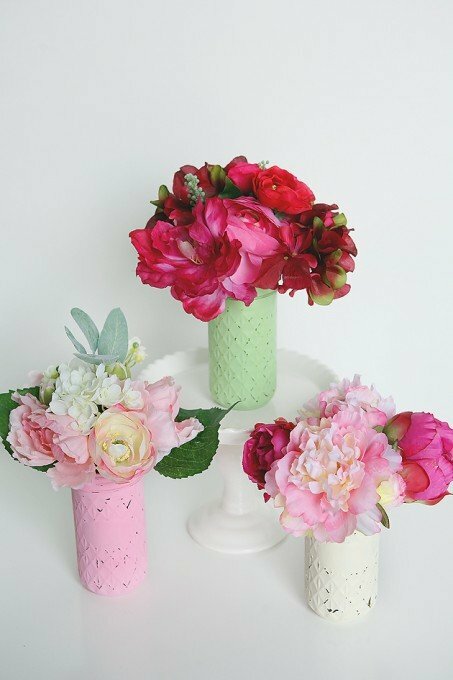 Checkout these Easy Spring Floral vases by Eighteen 25! They scream Spring, New Life, Sunshine... ahhh... everything I'm dreaming for. 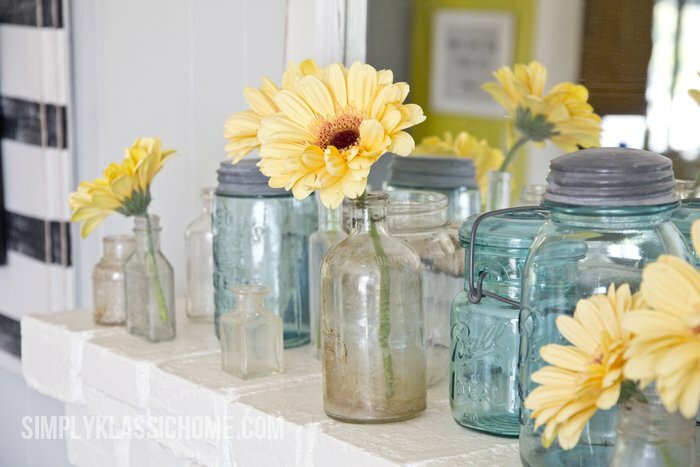 These vases are just mason jars painted. 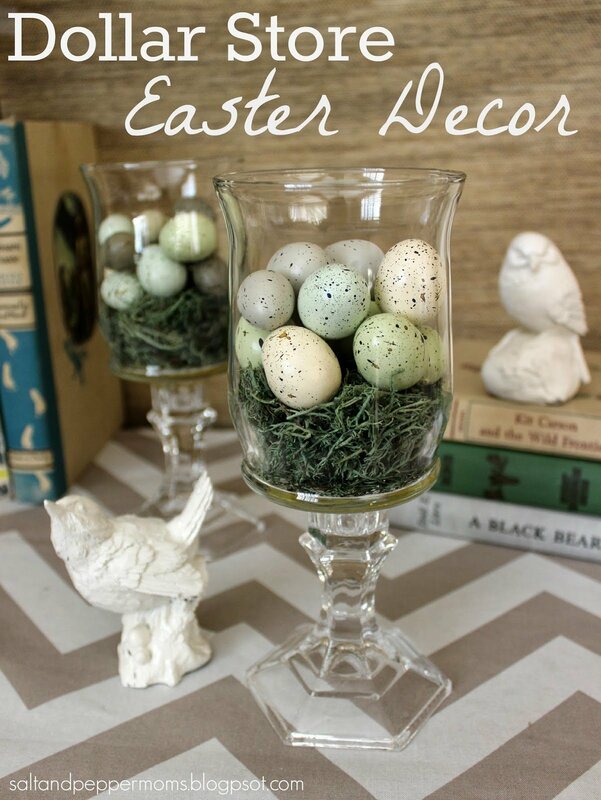 Super easy, super inexpensive but oh so pretty! 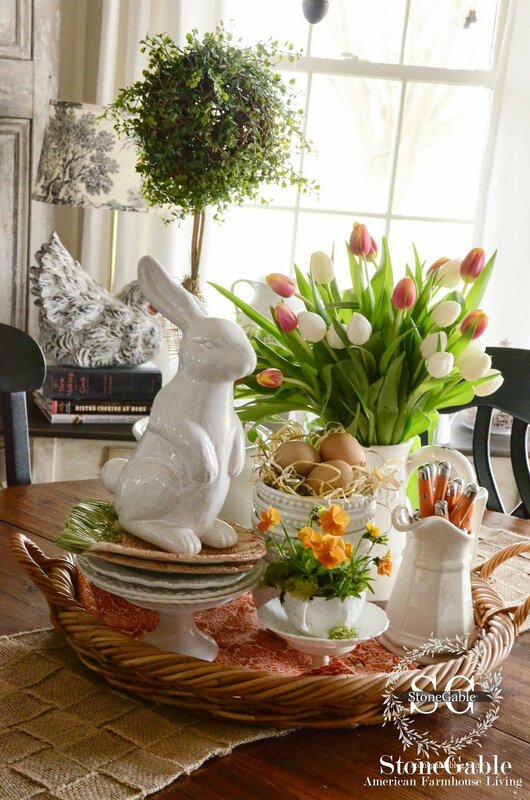 This Dollar Store Spring decor from Salt and Pepper Moms is so pretty! (and easy!) Keep these inexpensive tricks in mind and use them for other seasons as well. 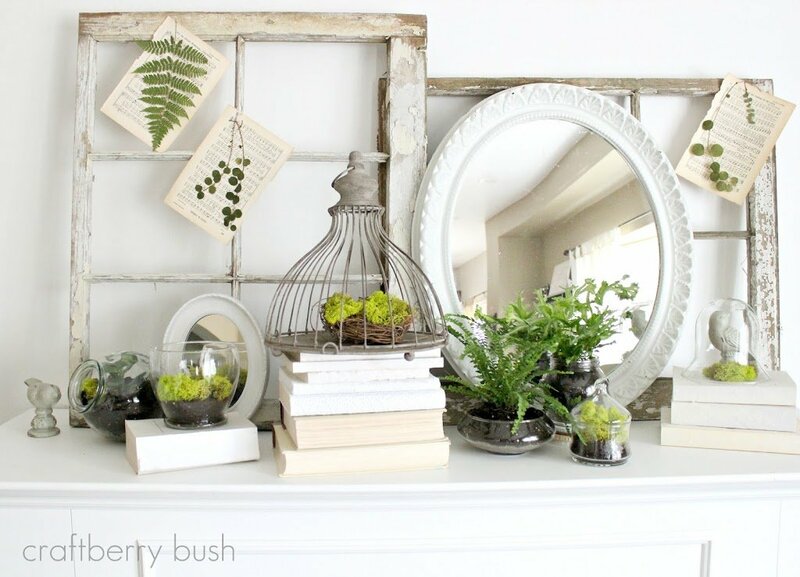 I'm in LOVE, LOVE, LOVE with this mantel by Craftberry Brush. It's so tranquil and peaceful. Garage sales are great places to find old window frames. I have one that I change up often. You can see that here and here. This Yellow and Blue Mantel from Yellow Bliss Road is very simple, yet beautiful. 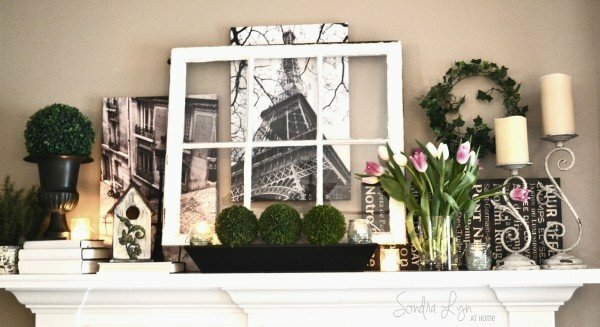 This Springtime in Paris mantel by Sondra Lyn at Home is really fun! Just an FYI Parisian decor is a real trend this spring. 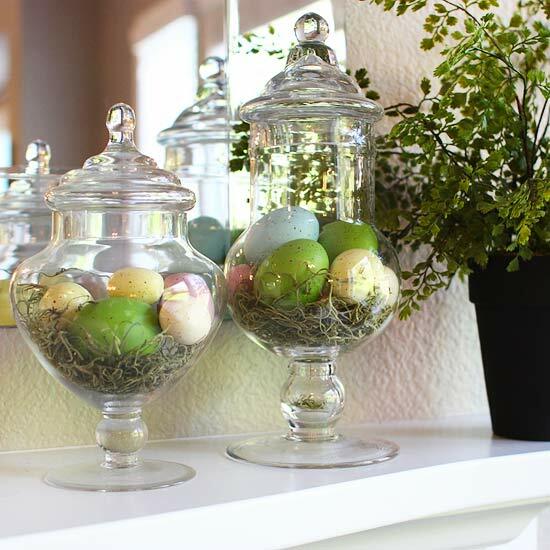 Here is a mantel that focuses on Easter using apothecary jars. 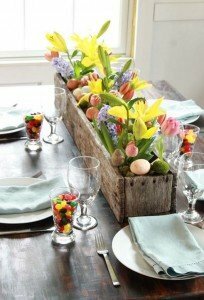 I want one of these trough centerpieces from How to Nest for Less for my kitchen table. 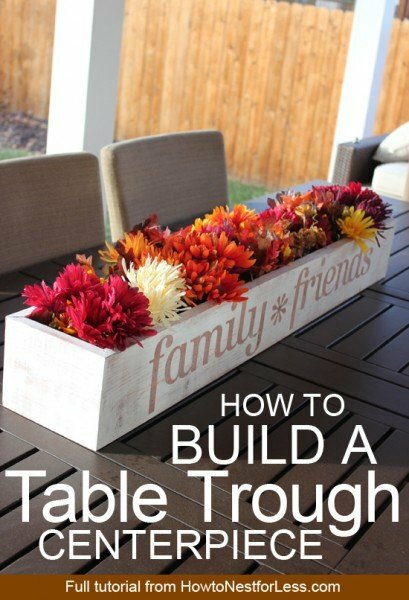 One of the great things about this centerpiece is you can use whatever colors you want and change with each season. For Spring I like this arrangement bur I like the above trough. These DIY Decorated Flower Pots by Just Imagine are inexpensive. 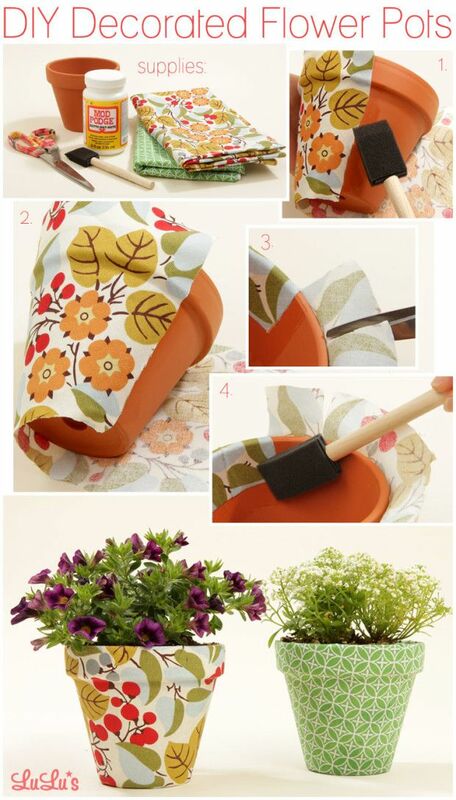 You probably have old pots lying around as well as some fabric. Don't have fabric? Try pretty napkins instead of fabric. These would be great to grow herbs in. Printables are a great way to add color to your decor for cheap! 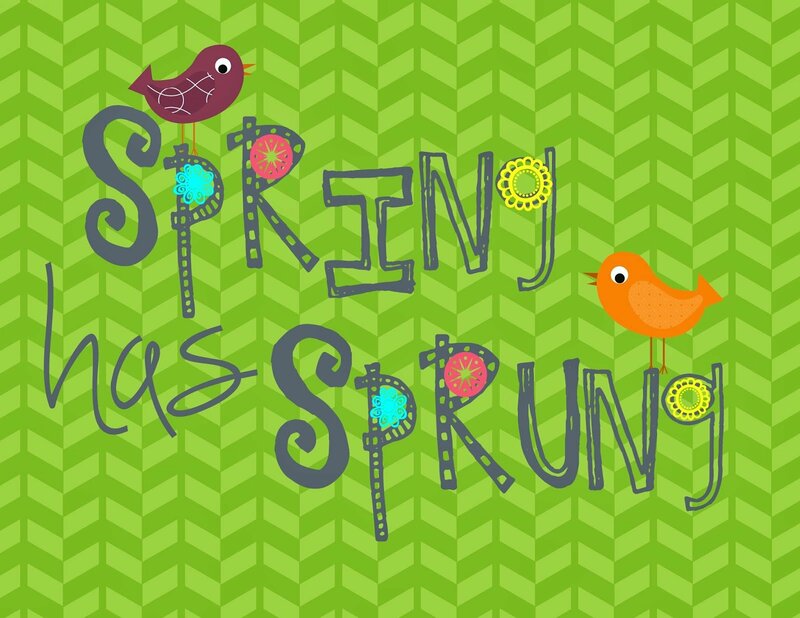 This Spring has Sprung printable is perfect for printing and framing and adding to a vignette. I hope I helped unthaw your creativity. Did you get any Spring inspiration? Which one is your favorite?? Thanks again Traci for inviting me to share with your readers. Have a blessed day!